What could be worse than a four year drought? Plenty. With various volcanoes erupting around our planet, the general doom and gloom of global warming, and the fear of meteors slamming into the earth, I started thinking about we could face locally. I also recently visited the Pompeii exhibit at the California Science Center with its artifacts and depiction of the ancient city being buried by the eruption of Mt. Venuses. All of these inspired this digital imaging project. The eruption of Mammoth Mountain. A web search provided lots of reference material for ash clouds. And it didn’t take long to find a pyroclastic flow images either. Both of these volcanic characteristics are applicable to eruptions in the Eastern Sierra. The trick to convincing photo montage is matching light and color balance. Since I could not visit erupting volcanoes and choose my light, I’ve matched lighting on Mammoth Mountain to existing stock volcano images. The familiar view of the mountain as seen from Hwy 395 works perfectly. What a view it be from your car! And now the fun! I’ve conceived the eruption emitting from mid-mountain in a high intensity blast creating a massive crater still rimmed by the summit ridge. Pyroclastic flows would fan out from the explosion, including one descending the mountain toward the town. Prevailing winds would drift the ash cloud towards town as well, creating our own Pompeii effect. 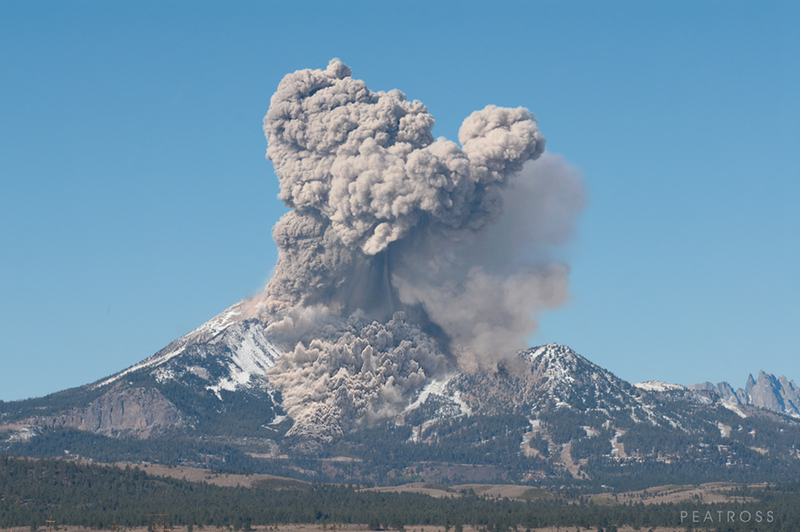 This depicts the initial eruption as Mammoth Mountain comes back to life. The view at night will be spectacular….